One of the first times (if not THE first time) J and I went to my parents’ house as a couple, they served what we like to call “Roll Your Own Sushi.” My sister and I had grown having these dinners where mom would put plates of sliced sashimi, cucumbers, imitation crab (hey- it’s great in sushi rolls!) 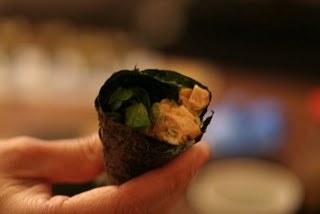 and sheets of toasted nori on the table along with a large bowl of sushi rice, and we would each make our own handrolls. I guess it’s akin to sandwich night, but instead of platters of coldcuts and loaves of bread, you’d see all of the ingredients necessary to make handrolls. Well let me tell you- J, who had NOT grown up having Roll Your Own Sushi Night was completely, utterly impressed and asked me every day for weeks after that if we could do it at our own home. It’s kind of funny because to people like my mom and me, Roll Your Own Sushi is an easy supper; a good way of making others do the work- I mean, there isn’t much effort involved in making a pot of sushi rice, and beyond that it’s just some slicing, dicing and plating. 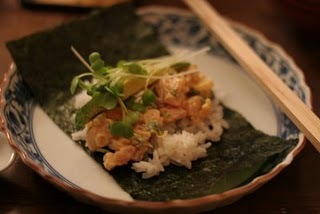 So the other night when I felt like eating sushi but didn’t feel like going out (a rarity, I know! 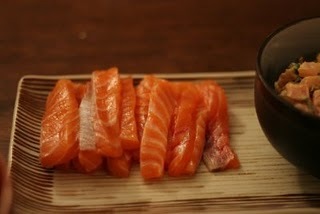 ), I stopped at Fish King on my way home from work and picked up some salmon and hamachi sashimi. The salmon was beautiful and completely odorless (a very good sign as fish should never smell really fishy) so I sliced it into thin strips, while the yellowtail had a bit of a fishy smell so I rinsed it, patted it dry and diced it into a spicy hamachi mixture. After combining some Kewpie Mayonnaise with rayu (chili oil) and Sriracha, I folded the chopped hamachi in with a handful of diced green onions and seasoned it ever so lightly with a touch of sea salt. 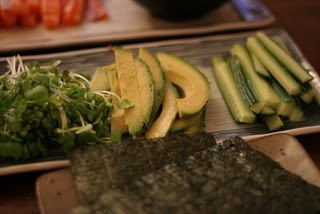 For the veggie elements I decided on Japanese cucumbers, diakon sprouts and Haas avocados. I toasted sheets of nori over the flame on my stovetop and mixed in a portion of instant sushi rice seasoning (I know, it’s cheating but it was a weeknight!) into my pot of hot, Japanese rice and placed it all on the table. Personally, I think the thing that goes best with handrolls is miso soup, so I made a pot of that as well, using silken tofu and scallions as additions. 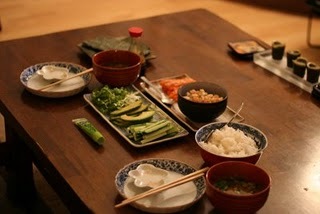 We made some hojicha, hunkered down and got to work rolling our own sushi. My favorite combo that night ended up being spicy a hamachi/cucumber/avocado handroll while J made lots with the salmon/daikon sprouts/avocado. The great thing about rolling your own sushi is you can make whatever combination you like, and it’s fun to play around with the flavor and texture combinations. I have to admit- we got full quite quickly and there ended up being some salmon left over, which we cooked up into BBQ salmon crostini (slices of toasted baguette topped with quick pickled red onions, slices seared salmon coated in BBQ sauce and thinly sliced avocado) the next night . I highly recommend cooking any left over sashimi you have if you plan to eat it the next day- it’s great in miso soup too- but never eat it as sashimi just in case. Roll Your Own Sushi is great when you have friends over, and you really don’t need to buy a lot of sashimi to feed a crowd- the rice and veggies can be the main element- so it isn’t as expensive as eating sushi out. Maybe you’ll try it? It’s fun too! 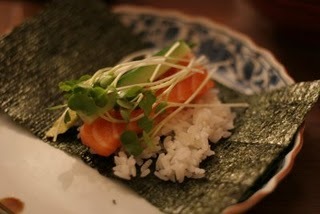 This entry was posted in Fish King Glendale, Japanese cooking, Roll your own sushi, Sushi at home. Bookmark the permalink. We did exactly the same one rainy Friday (did not feel like going out) – it’s easy on chef, fun for everyone, and really satisfying dinner. Very nice blog, I’ll be back. I found your Peruvian chicken piece and it was very good. Sounds like a lot of fun! Cat and I do build your own wrap nights. Sorta the same thing, I guess. Simple entertaining idea with lovely photos! Chris: Thank you- I will try the hambone next time. Jessica: Thanks- I am really trying to take better photos but it just doesn’t come naturally to me, so I am glad you think so! Thanks!! I work for Chatterbox PR and we would love to send you a press release regarding a brand new Pasadena restaurant! Please let me know if we can send it to you via email. Thanks so much, and I’m sorry for having to write this in a comment, but I couldn’t find your email address. Looking forward to hearing from you. i know i’m late to the barbecue on this post, but thanks for giving me a great dinner idea. thanks also for the fish king tip. i’m gonna check it out this weekend. Milla- thanks for reading. 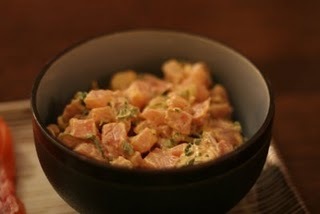 Fish King is great- their salmon sashimi is almost always perfect but I find their ahi a bit fishy at times. They have a great selection of non-sashimi-grade fish as well. Good luck!